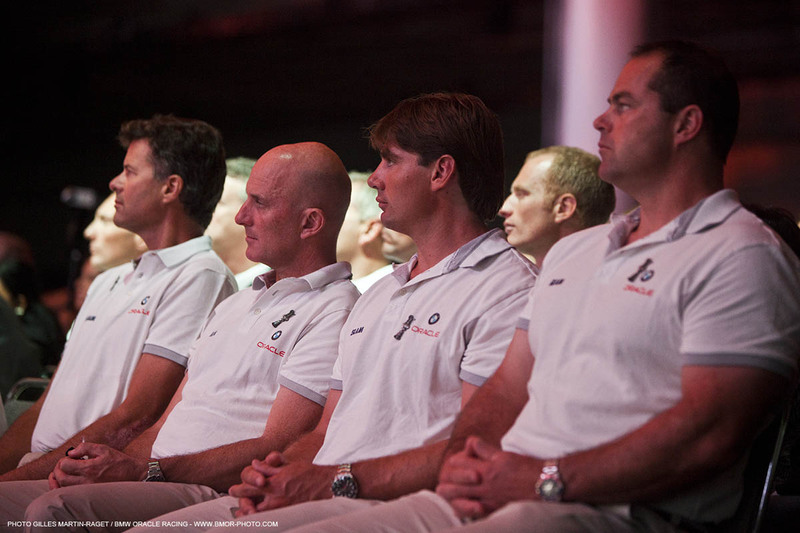 BMW ORACLE Racing was a proud guest of honor at the Oracle OpenWorld technical conference last week in San Francisco. 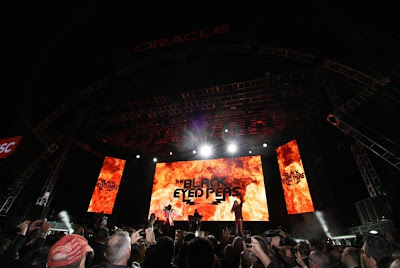 From Oracle CEO Larry Ellison’s opening keynote speech to Lance Armstrong, the San Francisco Museum of Modern Art and a hip-hop closing party, the week was full of goodwill and camaraderie. 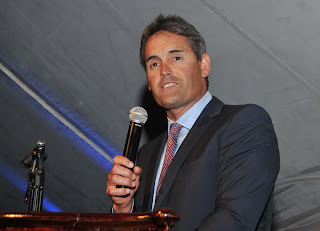 Watch a video of the Q&A sessions hosted by Tom “The Chairman” Ehman. 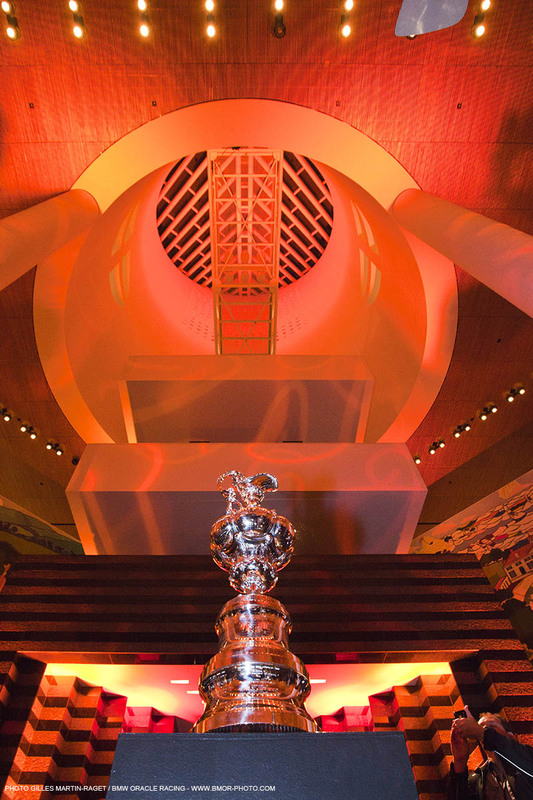 The America’s Cup enjoyed a colorful stop at the San Francisco MOMA. The Cup stood tall in the huge atrium rising more than 100 feet, adorned in colors and hues not normally associated with the blues and greens of seawater. 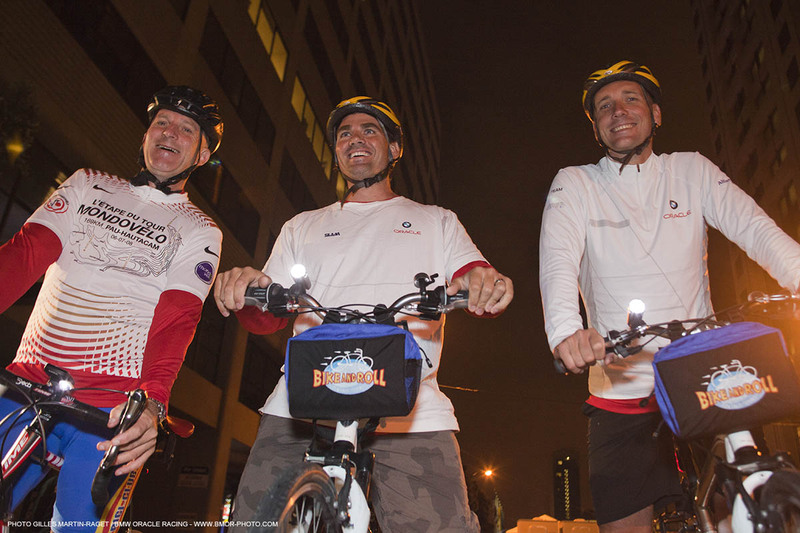 Team members Ian Burns, Jono MacBeth and Brad Webb saddled up with Lance Armstrong for an early morning tour of San Francisco’s Embarcadero waterfront. The trio was among a group of riders who helped Armstrong launch a new dual green/healthy initiative of riding to work. Below, Burns (left white shirt) and MacBeth (right white shirt) pepper Armstrong with questions while helping set pace in the peloton. Rock Opolis, the Oracle Appreciation Event, entertained some 40,000 guests on the final night of the conference. 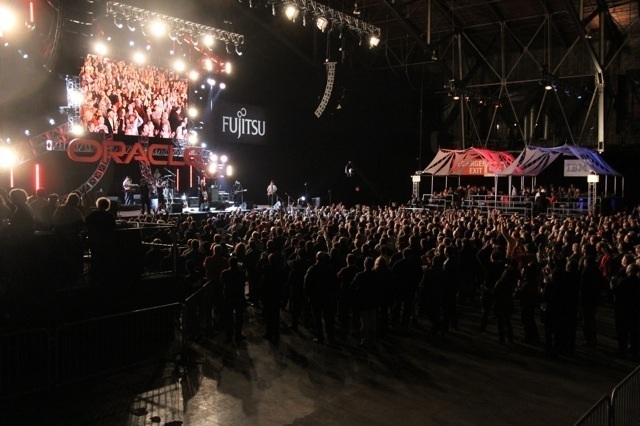 Six bands played on two stages, one outdoors and one indoors. 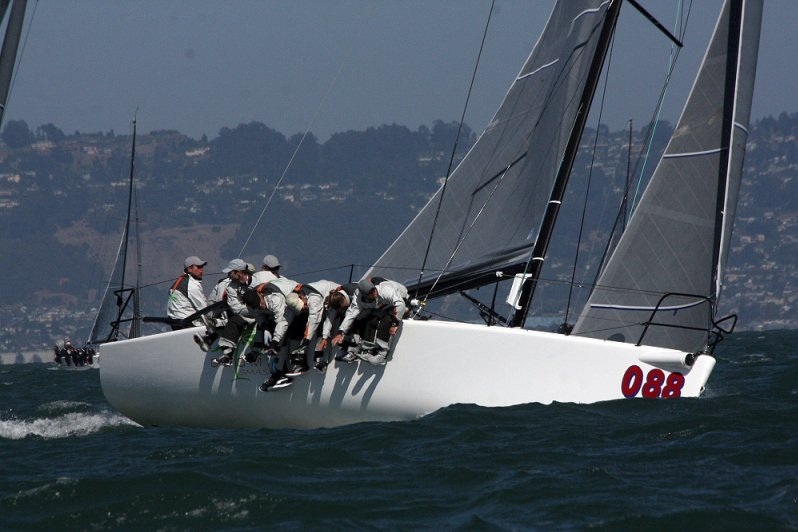 Wrapping up the week, team CEO Russell Coutts took to the water as tactician for Doug Douglass in the Melges 32 World Championship, held on the Berkeley Circle. The crew aboard Goombay Smash (below) posted two bullets in the first four races to lead overall by 1 point before throwouts were counted. Their performance in the second half of the event didn’t add up as strongly and they placed seventh overall with 87 points. 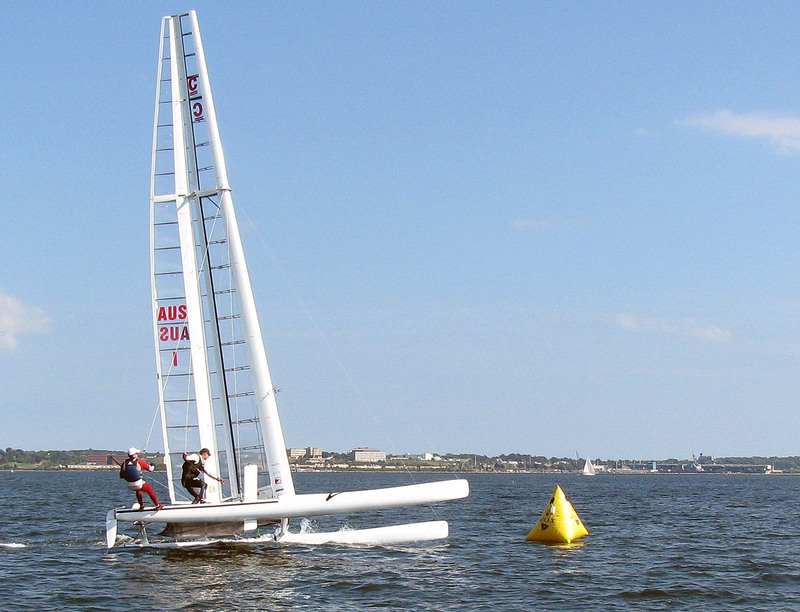 Luca Lalli’s Italian crew aboard B-lin Sailing captured the title with 48 points. 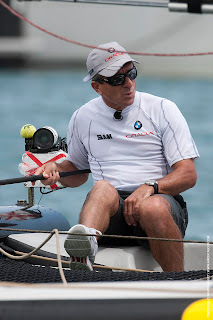 ﻿In their day jobs, Ian “Fresh” Burns, Jono MacBeth and Brad Webb are, respectively, the design coordinator, grinder and bowman for BMW ORACLE Racing. In the pre-dawn hours, however, they’re Lance Armstrong followers. At least for today. 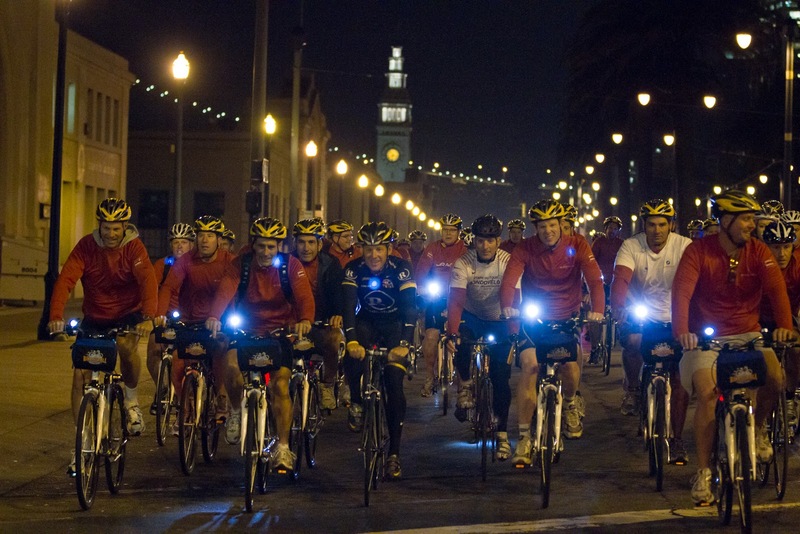 The trio joined the cycling star, the all-time winner of the Tour de France and, perhaps, the most famous survivor of cancer, for a cycle around San Francisco this morning along with employees of Oracle Corp. 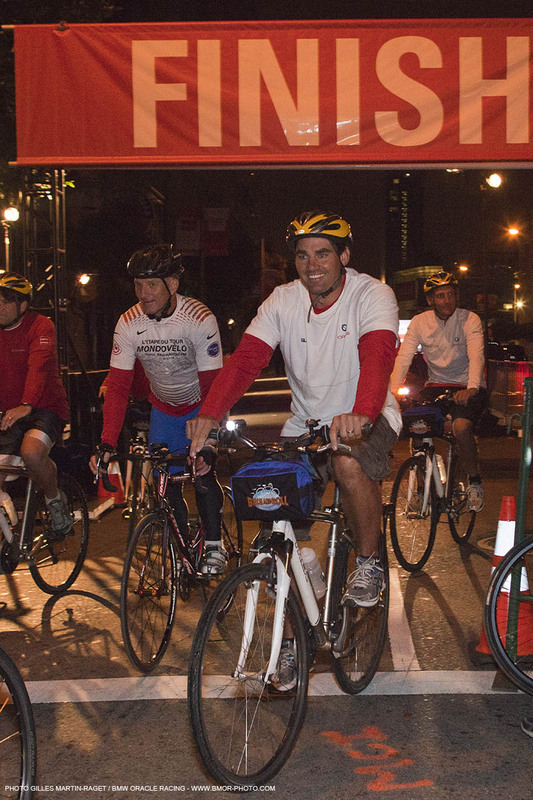 The ride, organized as part of the Oracle OpenWorld technical conference, helped promote a dual green/exercise initiative from Armstrong, who’s urging city dwellers to ride to work instead of driving as a way to get healthy while reducing one’s carbon footprint. The 50-minute ride avoided many of San Francisco’s famous hills and instead took the cyclists along the Embarcadero, the waterfront drive along San Francisco Bay. 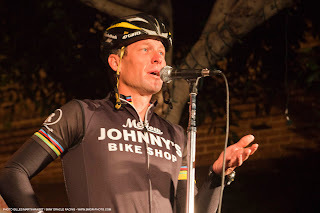 Everyone was a winner in this ride, and afterwards the crowd of some 100 cyclists gathered for breakfast and a question and answer with Armstrong. One of the questions from the crowd came from a woman whose sister has cancer. "The most important thing I can relate about having lived through cancer is to be an engaged patient,” Armstrong (left) replied. “Understand what’s going on with your body and establish a relationship with your doctor. “When I had cancer in ’96 there was no Google, you couldn’t get on the Internet and search about your illness. We had to go to the bookstore. Now, with the Internet, the patient is empowered,” said Armstrong. Armstrong said that his involvement with cycling is winding down. While he’ll do events like the Tour Down Under and Tour de California, he won’t compete in the Tour de France. Armstrong said he plans to compete in the New York City marathon this fall, and hopes to compete in triathlons after deciding if he can still swim. 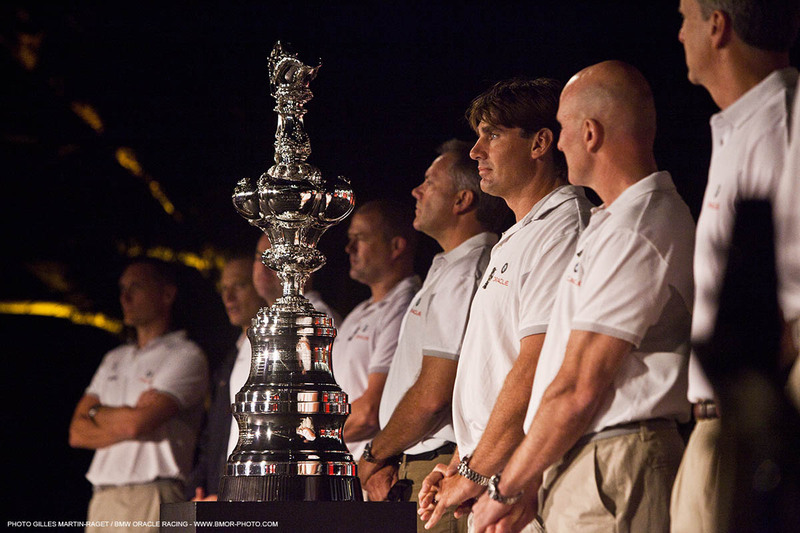 Although the BMW ORACLE Racing victory tour officially ended in June, the team is still being celebrated for its victory in the 33rd America’s Cup. Team founder Larry Ellison (right), the CEO of Oracle Corp., opened the annual Oracle OpenWorld business conference on Sunday night by presenting 15 members of the team to the audience at the Moscone Center ahead of his welcoming keynote speech. 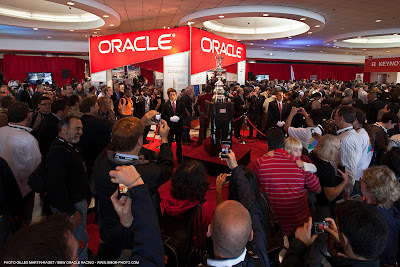 Oracle OpenWorld is the world’s largest gathering of Oracle customers, partners and technologies. 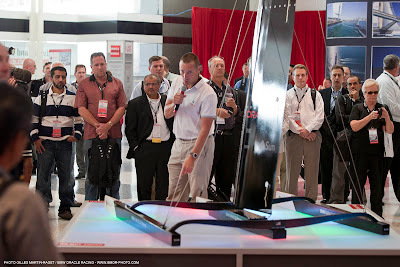 Simply put, it is a massive conference with a record attendance this year of 41,000 registrants from 116 countries. 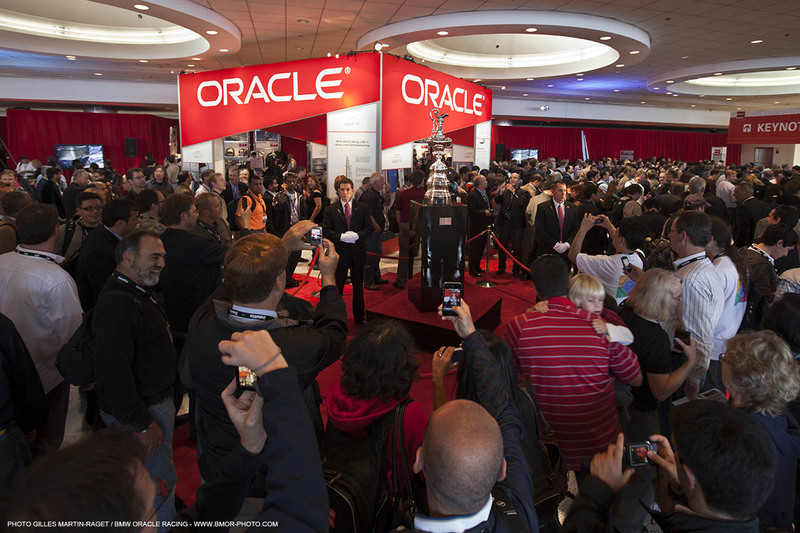 It features more than 1,800 sessions, 400 partner exhibits and nearly 400 live Oracle demos. 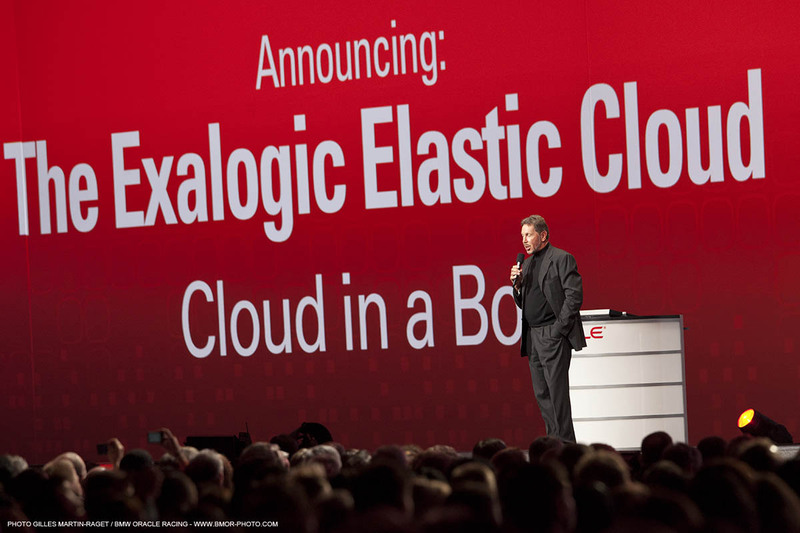 A total of 726,000 seats were required for the conference, and the estimated population of San Francisco is slightly more than 808,000. 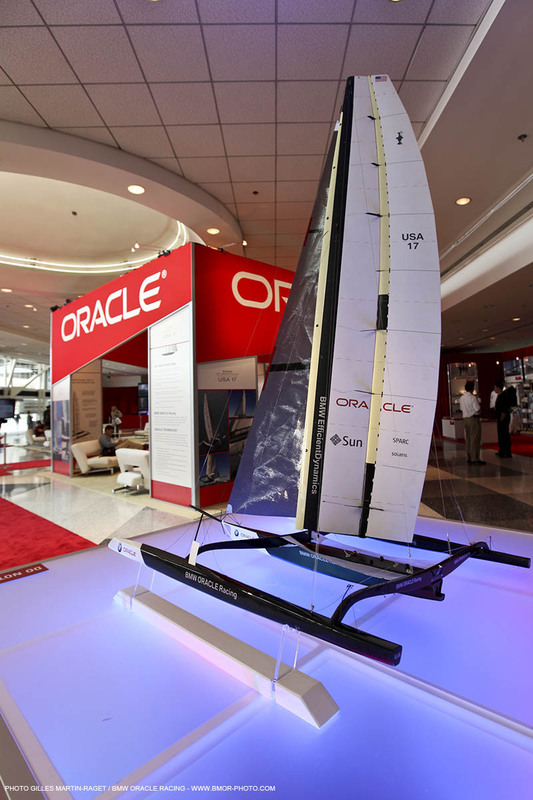 The America’s Cup trophy and members of the team will be on display at the America’s Cup Pavilion in the Moscone North Upper Lobby. 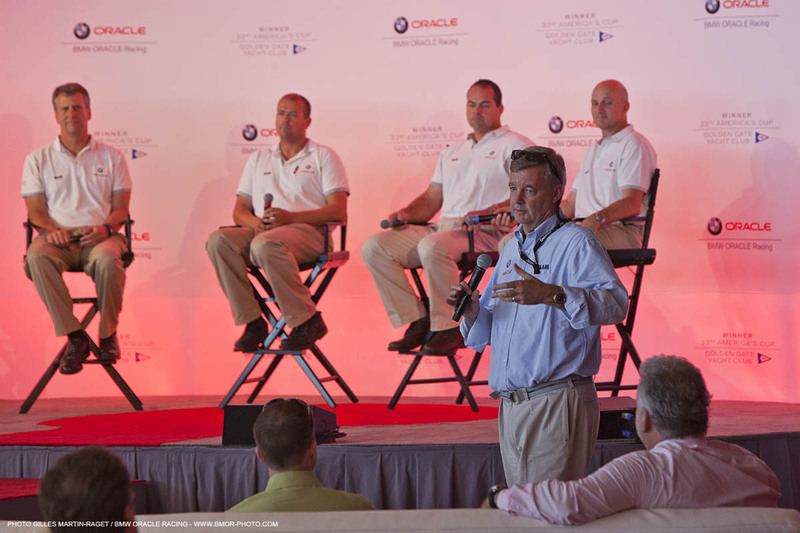 The America’s Cup Pavilion provides a showcase for the BMW ORACLE Racing experience and will be open throughout the week with morning shows and panel discussions hosted by the team’s head of external affairs, Tom “The Chairman” Ehman. 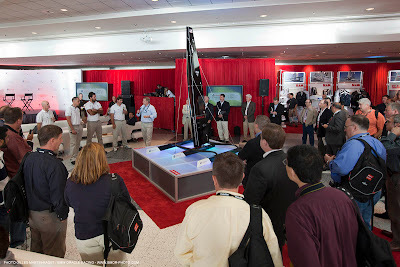 Team members will be available for question and answer sessions and to sign posters. The Pavilion is open daily beginning at 9:30 am. The sailing program Mainsail was at the International C Class Catamaran Championship in Newport, R.I., last month recording the action where BMW ORACLE Racing skipper Jimmy Spithill and sailing coach Glenn Ashby placed second to Canadian victors Fred Eaton and Magnus Clarke. The program features interviews with Spithill, Ashby and Clarke as well as some outstanding race footage. 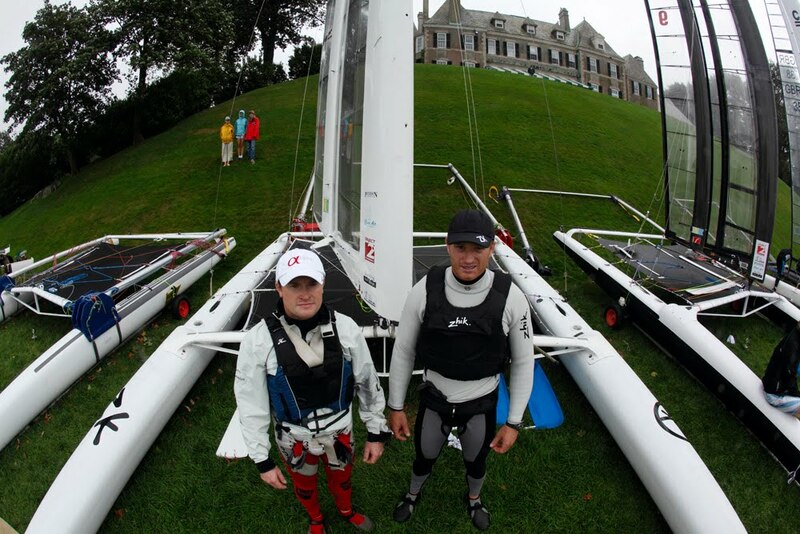 Watch Ashby and Spithill nail a port-tack start at high speed in winds around 18 knots! Russell Coutts, CEO of BMW ORACLE Racing, unveiled a new vision for the future of the America’s Cup today at a press conference at the team’s base in Valencia. Coutts was joined by Vincenzo Onorato, President of the Challenger of Record syndicate Mascalzone Latino, in announcing that the next craft for the 34th America’s Cup will be a high-performance, wingsail catamaran known as the AC72. Other new developments include the formation of an America’s Cup World Series to bring Cup racing to new shores and audiences beginning next year, the creation of the AC45, a scaled-down wingsail catamaran intended to acquaint monohull sailors with multihull racing, and the Youth America’s Cup, which will begin in 2012. Today’s announcement of the Protocol, class of boat and year of the match cements three of the four cornerstones for the next event. The final piece, the venue, is scheduled to be announced by the end of the year. For more information, please visit the America’s Cup website. 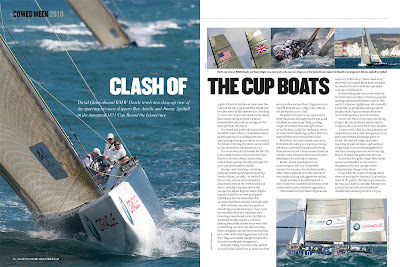 Yachting World editor David Glenn rode aboard USA-98 last month at the 1851 Cup during the race around the Isle of Wight. 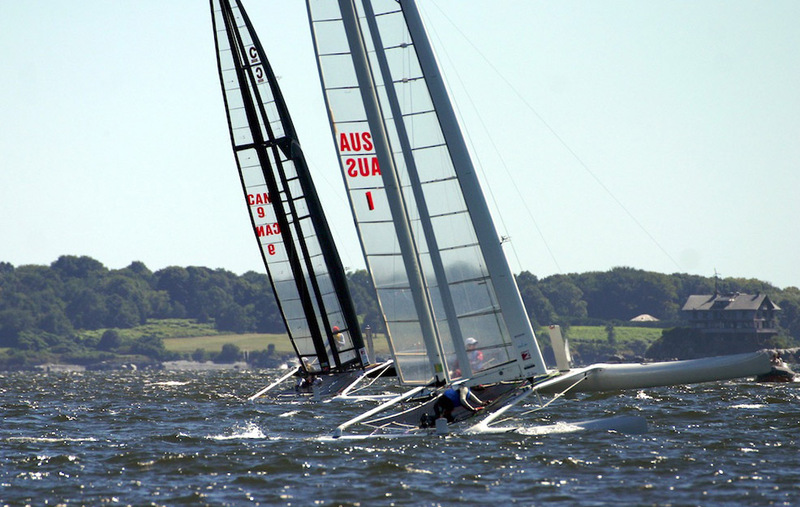 Riding as the 18th Man behind the afterguard of Jimmy Spithill, John Kostecki, Ian Moore and Murray Jones, Glenn walked off beaming from ear to ear. 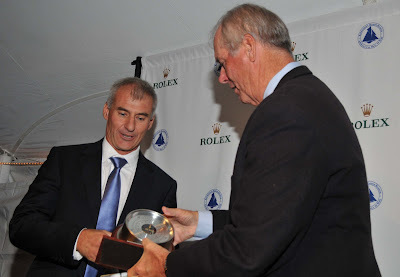 He filed the report posted below in the October 2010 issue of Yachting World. Congratulations to BMW ORACLE Racing boatbuilders Mark Turner and Tim Smyth who’ve been voted the Seahorse Sailors of the Month for September. Turner and Smyth were recognized for their determined effort organizing and coordinating the construction of the 90-foot long (on waterline) and 90-foot wide trimaran USA, which won the 33rd America’s Cup Match last February. 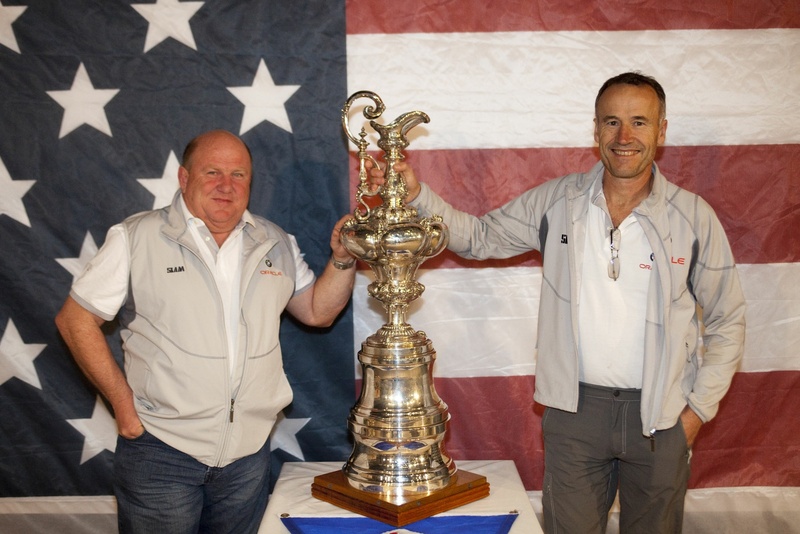 Turner and Smyth were but two of hundreds of people who spent more than 150,000 man hours creating the largest America’s Cup challenger since New Zealand in 1988. 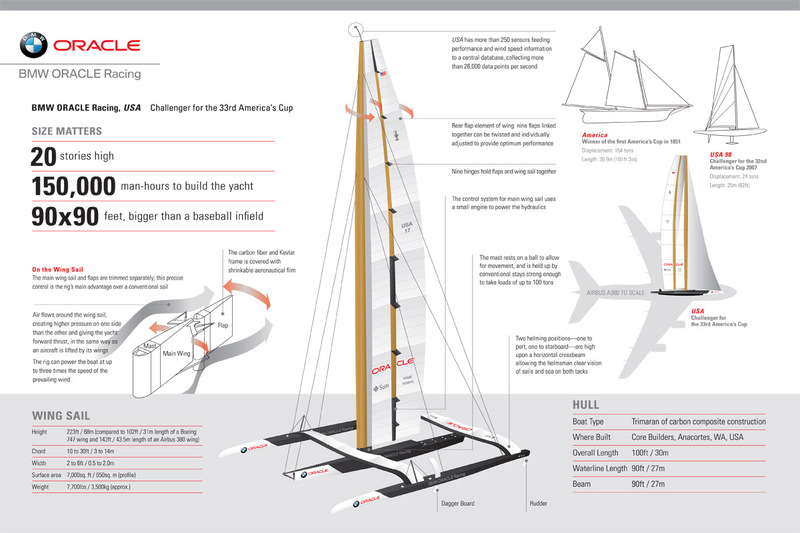 The piece de resistance of the design was the towering wing mast that stands 223 feet tall. 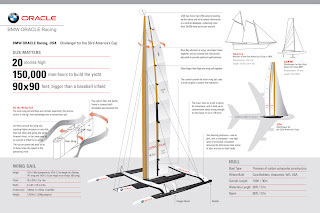 Not only is the wing 55 percent larger than the wing of an Airbus A380 passenger jet, it also inhibits the trimaran from passing under many of the world’s bridges. Turner and Smyth beat out another BMW ORACLE Racing team member for the honor, Glenn Ashby. 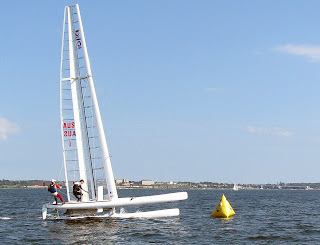 Ashby, the sailing coach during the lead-up to the 33rd Match, was nominated for winning his seventh A Class Catamaran World Championship in July. 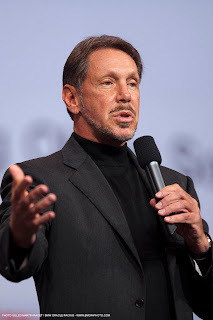 Previously, team founder Larry Ellison won the June Seahorse Sailor of the Month award for his resoluteness in chasing the America’s Cup and also capturing the RC 44 event in Copenhagen at the beginning of June.